Objectives: The function of γ-amino butyric acid receptor (GR) was related with tinnitus. But, the effects of Spirulina platensis water extract (SP) on the mRNA expression of GRA β 3 in mice with tinnitus were still unclear. Method: Eighteen SAMP8 mice were divided into the control group (intraperitoneal injection of saline, once per day), the tinnitus group (intraperitoneal injection of salicylate, 300 mg/kg body weight once per day), and the spirulina group [intraperitoneal injection of salicylate, 300 mg/kg body weight and oral SP supplementation (1000 mg/kg body weight) once per day]. Effects of SP on the mRNA expression of GRA β 3 in the cochlea and brain of mice were studied for 4 days. Results: Compared to the control group, the tinnitus group had significantly higher tinnitus scores and lower mRNA expression of GRA β 3 gene in the cochlear, brainstem, hippocampus and parahippocampus, temporal lobes, and the frontal lobes. On the other hand, the spirulina group had significantly lower tinnitus scores and higher GRA β 3 gene expression than the tinnitus group in all tested areas. Conclusion: SP could reduce salicylate-induced tinnitus possibly via increasing the salicylate-induced down-regulation of GRA β 3 gene expression. Tinnitus is a common complex disease and often results from auditory dysfunction, although many other etiologies were reported . Some mechanisms including the neural receptor theory were proposed in these decades. For example, gene expression and/or function of N-methyl D-aspartate (NMDA) receptor (NR) increased in the inner ear and/or auditory nervous system [2,3]. On the contrary, function and/or gene expression of the γ-amino butyric acid (GABA) receptor (GR) and cannabinoid receptor in some brain areas decreased in the condition of tinnitus [4-6]. In addition, oxidative stress damage and/or neural inflammation in the peripheral and central auditory system were also important mechanisms of tinnitus [7-10]. Some literatures in traditional Chinese medicine had said that algae could prevent hearing loss and/or tinnitus. Previously, our study group had found that Spirulina platensis water extract (SP) and/or its active component [c-phycocyanin (CPC)] could decrease tinnitus, and the mRNA expression of NR2B and pro-inflammatory genes in the cochlea and brain during salicylate-induced tinnitus . SP could modulate the endogenous antioxidant gene expression and reduce malondialdehyde levels in some brain areas9. Also, we found that SP could prevent salicylate-induced up-regulation of Na+-K+-2Cl-co-trans -porter 2 (KCC2 ) gene in the cochlear and brain  . However, effects of SP on the mRNA expression of GR gene in tinnitus were still unknown. In this study, we aimed to investigate the effects of SP on the salicylateinduced tinnitus and the mRNA level of GRAβ3 gene in the cochlea and tinnitus-related brain areas. Eighteen male SAMP8 mice of 3 months old were divided into three groups: the control group (saline injection per day for 4 days), the tinnitus group (salicylate injection, 300 mg/kg body weight per day for 4 days), and the spirulina group (salicylate injection, 300 mg/kg body weight and SP treatment, 1000 mg/kg body weight per day for 4 days). Institutional Animal Care and Use Committee of Dalin Tzu Chi Hospital had approved the protocol (0981117-03) used in this study. The component of SP had 35%-45% polysaccharides, 15%-25% phycobiliproteins, 10%-20% proteins, 10%-12% ash, and 5%-8% water (Far East Bio- Tec Co., Ltd., Taipei, Taiwan). All mice were conditioned to perform an active avoidance task in a box, which included a safe area and an electrical floor . The protocol of this task had 6 sessions (60 trials totally) and performed once a day for 5 days. A 10 kHz pure tone of 50 dB sound pressure level (SPL) with 3 seconds duration (conditioning stimulus), and an electric foot-shock of 3.7 mA for 30 seconds (unconditioned stimulus) were given in each trial. The mice ran into the safe area after they received these two stimuli. Only conditioned mice, which succeeded the task at least 80% in three consecutive sessions, were selected into subsequent experiments. An active avoidance task of 10 trials was performed 2 hours after intra-peritoneal saline injection (the control group), intraperitoneal sodium salicylate injection (300 mg/kg body weight) (the tinnitus group), or intra-peritoneal sodium salicylate injection (300 mg/kg body weight) plus oral SP supplementation (1000 mg/kg body weight) (the spirulina group) for 4 days. During tinnitus testing, a 10 kHz pure tone of 70 dBSPL with 3 seconds duration was given first for 3 seconds in each trial. We observed the mice movement for 5 seconds to see whether they ran into the safe area or not. If so, the mice were taken back to the electric floor for the ongoing observation. If not, electrical shock was given to remind the mice to ran into the safe area. Then, the mice were taken back on the electric floor for ongoing observation. After the above two conditions, we observed the total numbers of times the mice ran into the safe area during the inter-trial period of 1 minute of 10 trials as the tinnitus score. The pairs of cochlea and brain tissue were immediately taken and stored in -80°C refrigerator. RNA isolation was done using the RNA-Bee isolation reagent (Friendswood, USA) with a tissue homogenizer. The RNA quality was checked by Agilent Bioanalyzer 2100 and the ratio of absorbance measurements at 260 and 280 nm using the nanodrop. AGGAAATGAGCTTG-3’ (Protech-Taiwan, Taiwan). The thermal cycling conditions for PCR were adjusted to the following: 3 minutes initial set-up at 95°C; followed by 50 cycles, each of which consisted of 45 seconds of denaturation at 95°C, 45 seconds of annealing at 46°C, and 45 seconds of extension at 72°C for GRAβ3 gene;of 45 seconds of denaturation at 95°C, 45 seconds of annealing at 50°C, and 45 seconds of extension at 72°C for GAPDH gene. A final 10 minutes at 72°C for both genes. The cDNA products were measured by the Mini Horizontal Electrophoresis System (MJ-105/ MP-100, Major Science, Taiwan) and by E-Box-1000/26M Inspection Certificate and Analysis Systems (E-Box Spp-010 E-capt software, USA). The expression level of GRAβ3 gene was presented as relative ratios in comparison to GAPDH. The tinnitus scores were compared between three groups by one-way analysis of variance (ANOVA) with post-hoc Bonferroni correction. And, the mRNA expression levels of GRAβ3 gene at each site were compared separately between three study groups by one-way ANOVA with post-hoc Bonferroni correction. All above analysis were performed by the commercialized software “STATA10”, and p values <0.05 were considered statistically significant. Figure 1 showed the tinnitus scores of all groups before and 4 days after salicylate injection. The tinnitus scores were not significantly different in three groups before intra-peritoneal salicylate injection (mean ± standard deviation=1.0 ± 2.4, 0.0 ± 0.0, 0.5 ± 1.2, respectively; one-way ANOVA, p=0.5615). Compared to the control group (1.8 ± 4.5), the tinnitus group (10.7 ± 6.7), but not the spirulina group (3.2 ± 1.5 had significantly higher scores on the day 4 after salicylate injection (oneway ANOVA, p=0.0113; post-hoc Bonferroni analysis, p=0.016 and 1.000, respectively). And, the spirulina group had significantly lower scores than the tinnitus group on the day 4 after salicylate injection (post-hoc Bonferroni analysis, p=0.044). Figures 2-6 showed the mRNA expression levels of the GRAβ3 gene in different sites of three groups. The tinnitus group had significantly lower mRNA expression of GRAβ3 gene than the control group in the cochlea (0.72 ± 0.06 versus 0.98 ± 0.12; one-way ANOVA, p=0.0026; post-hoc Bonferroni analysis, p=0.023) (Figure 2), in the brainstem and IC [0.55 ± 0.12 versus 0.79 ± 0.18; one-way ANOVA, p=0.0003; post-hoc Bonferroni analysis, p=0.018] (Figure 3), in the temporal lobes [0.66 ± 0.04 versus 0.94 ± 0.09; one-way ANOVA, p<0.0001; post-hoc Bonferroni analysis, p<0.001] (Figure 5) , in the frontal lobes [0.75 ± 0.08 versus 1.04 ± 0.11; one-way ANOVA, p<0.0001; post-hoc Bonferroni analysis, p<0.001] (Figure 6), and in the hippocampus and parahippocampus [0.83 ± 0.07 versus 1.03 ± 0.11; one-way ANOVA, p=0.0012; post-hoc Bonferroni analysis, p=0.021] (Figure 4). 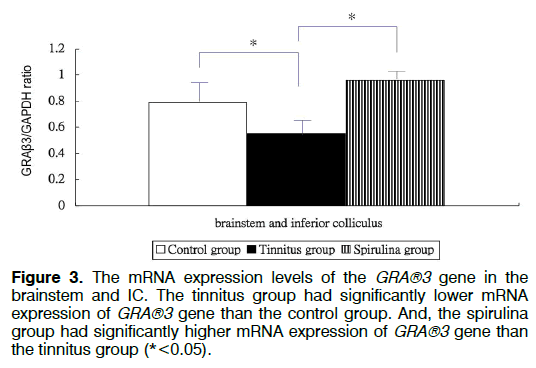 The spirulina group had significantly higher mRNA expression of GRAβ3 gene than the tinnitus group in the cochlea (1.07 ± 0.22, post-hoc Bonferroni analysis, p=0.003) (Figure 2), in the brainstem and IC (0.96 ± 0.08, posthoc Bonferroni analysis, p<0.001) (Figure 3), in the temporal lobes (0.77±0.08, post-hoc Bonferroni analysis, p=0.050) (Figure 5), in the frontal lobes (1.15 ± 0.10, post-hoc Bonferroni analysis, p<0.001) (Figure 6), and in the hippocampus and para-hippocampus (1.12 ± 0.14, post-hoc Bonferroni analysis, p=0.001) (Figure 4). Figure 1: The tinnitus scores of all groups before and 4 days after salicylate injection. The tinnitus scores were not significantly different in three groups before intra-peritoneal salicylate injection (p=0.8921). 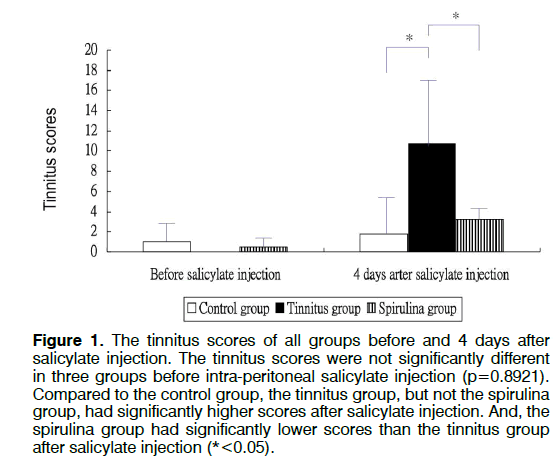 Compared to the control group, the tinnitus group, but not the spirulina group, had significantly higher scores after salicylate injection. And, the spirulina group had significantly lower scores than the tinnitus group after salicylate injection (*<0.05). Figure 2: The mRNA expression levels of the GRA®3 gene in the cochlea. The tinnitus group had significantly lower mRNA expression of GRA®3 gene than the control group. 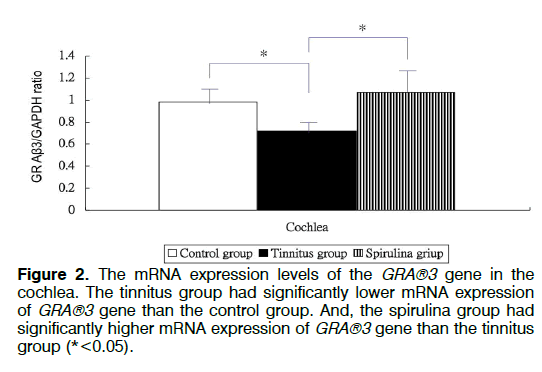 And, the spirulina group had significantly higher mRNA expression of GRA®3 gene than the tinnitus group (*<0.05). Figure 3: The mRNA expression levels of the GRA®3 gene in the brainstem and IC. The tinnitus group had significantly lower mRNA expression of GRA®3 gene than the control group. And, the spirulina group had significantly higher mRNA expression of GRA®3 gene than the tinnitus group (*<0.05). Figure 4: The mRNA expression levels of the GRA®3 gene in the hippocampus and para-hippocampus. The tinnitus group had significantly lower mRNA expression of GRA®3 gene than the control group. 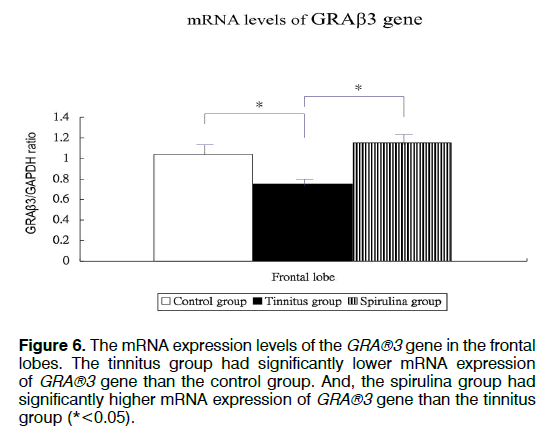 And, the spirulina group had significantly higher mRNA expression of GRA®3 gene than the tinnitus group (*<0.05). Figure 5: The mRNA expression levels of the GRA®3 gene in the temporal lobes. The tinnitus group had significantly lower mRNA expression of GRA®3 gene than the control group. 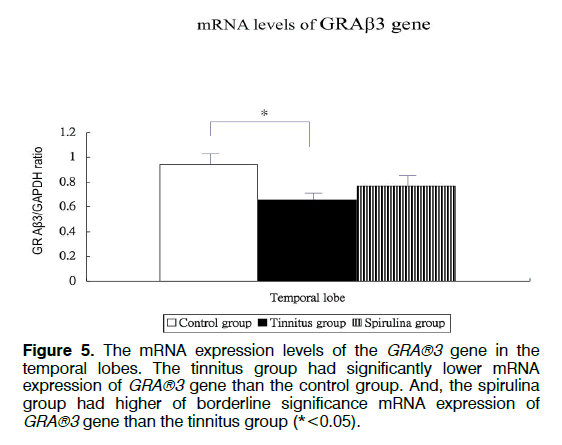 And, the spirulina group had higher of borderline significance mRNA expression of GRA®3 gene than the tinnitus group (*<0.05). Figure 6: The mRNA expression levels of the GRA®3 gene in the frontal lobes. The tinnitus group had significantly lower mRNA expression of GRA®3 gene than the control group. 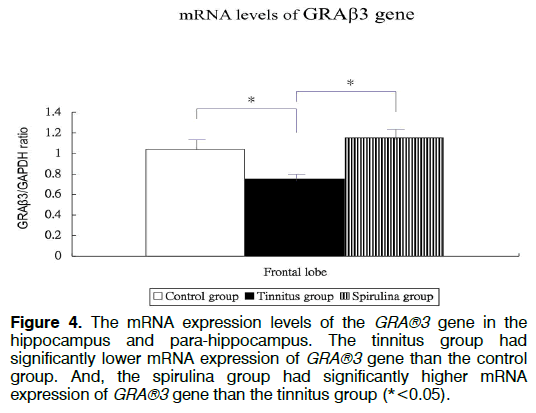 And, the spirulina group had significantly higher mRNA expression of GRA®3 gene than the tinnitus group (*<0.05). This experimental study showed that mRNA expression of GRAβ3 gene decreased in the cochlea and several tinnitus-related areas in the brain after highdose salicylate injection. Meanwhile, SP could reduce salicylate-induced tinnitus, and prevent salicylateinduced down-regulation of GRAβ3 gene in the cochlea and some tinnitus-related areas. GABA, an inhibitory neurotransmitter, exerted its effects through ionotropic GRA and GRC, and GRB in the brain. GRA is a ligandgated chloride channel . Phosphorylation of GRAβ1 subunits reduced GRA currents, whereas phosphorylation of GRAβ3 subunits increased GRA currents . Salicylate increased the sound-evoked field potentials in the auditory cortex via interfering the GABA-mediated inhibition . Conversely, activation of GR in IC and auditory cortex could reduce tinnitus in animals [4,15]. Currently, we showed that mRNA expression of GRAβ3 gene decreased in the cochlea and several tinnitus-related brain areas during salicylate-induced tinnitus. Collectively, these data suggested that GR was negatively associated with tinnitus at the mRNA and protein levels along the peripheral and central auditory pathways. Previous studies showed that SP could prevent neuroinflammatory diseases by inhibiting nicotinamide adenine dinucleotide phosphate (NADPH) oxidase and COX , and modulating the activities and/or mRNA expressions of endogeneous antioxidant genes . Although accumulation of arachidonic acid (AA) caused by inhibition of COX could potentiate NR currents in salicylate-induced tinnitus , our previous and current studies have suggested that antiinflammation was the dominant mechanism underlying the beneficial effect of SP on salicylate-induced tinnitus. Inflammatory and/or oxidative stress insults could violate the functions of cell membrane, cytoplasm and nucleus. For example, severities of inflammatory responses were correlated with GABA gene expression in post-status epilepticus . The activities of GRA increased in inflammation-induced memory loss . Activation of proinflammatory cytokines, GRA and GRC genes were found simultaneously in the brain in status epilepticus . On the other hand, inflammatory stimuli could regulate alternative splicing of GRB gene in Alzheimer disease . Therefore, it is reasonable to suppose that high dose salicylate might induce tinnitus via modulation mRNA expression of GRAβ3 gene. Second, it is also reasonable to suppose that anti-inflammatory agent and/or antioxidants could reduce salicylate-induced tinnitus as we showed here. The mRNA expression of GRAβ3 gene decreased in the cochlea and several tinnitus-related areas in the brain during salicylate-induced tinnitus. And, SP, which exerts anti-inflammatory and anti-oxidative capacities, could reduce salicylate-induced tinnitus and prevent salicylate-induced down-regulation of GRAβ3 gene in the cochlea and some tinnitus-related areas. This study was supported by grants from the National Science Council, Taiwan (NSC-99-2314-B-303-001-MY3). Issa M, Bisconti S, Kovelman I, Kileny P, Basura GJ. Human auditory and adjacent nonauditory cerebral cortices are hypermetabolic in tinnitus as measured by functional near-infrared spectroscopy (fNIRS). Neural Plast. 2016:1-13. Hwang JH, Chen JC, Yang SY, Wang MF, Liu TC, Chan YC. Expression of COX-2 and NMDA receptor genes at the cochlea and midbrain in salicylate-induced tinnitus. Laryngoscope. 2011;121(2):361-4. Puel JL, Guitton MJ. Salicylate-induced tinnitus: molecular mechanisms and modulation by anxiety. Prog Brain Res. 2007;166:141-6. Wang HT, Luo B, Zhou KQ, Xu TL, Chen L. Sodium salicylate reduces inhibitory postsynaptic currents in neurons of rat auditory cortex. Hear Res. 2006;215(1-2):77-83. Hwang JH, Chan YC. Expressions of dopamine receptor 1A and cannabinoid receptor 1 genes in the cochlea and brain after salicylate-induced tinnitus. ORL J Otorhinolaryngol Relat Spec. 2016;78(5):268-75. Zheng Y, Baek JH, Smith PF, Darlington CL. Cannabinoid receptor down-regulation in the ventral cochlear nucleus in a salicylate model of tinnitus. Hear Res. 2007;228(1-2):105-11. Hwang JH, Chen JC, Yang SY, Wang MF, Chan YC. Expression of TNF-alpha and IL-1 beta genes in the cochlea and midbrain in salicylate-induced tinnitus. J Neuroinflamm. 2011;8:30-6. Hwang JH, Chen JC, Chan YC. Effects of c-phycocyanin and spirulina on salicylate-induced tinnitus, expression of NMDA receptor and inflammatory genes. PLOS ONE. 2013;8(3):e58215. Hwang JH, Chang NC, Chen JC, Chan YC. Expression of antioxidant genes in the mouse cochlea and brain in salicylate-induced tinnitus and effect of treatment with spirulina platensis water extract. Audiol Neurotol. 2015;20:322-9. Hwang JH, Chan YC. Expressions of ion co-transporter genes in salicylate-induced tinnitus and treatment effects with spirulina. BMC Neurol. 2016;16(1):159-64. Guitton MJ, Caston J, Ruel J, Johnson RM, Pujol R, Puel JL. Salicylate induces tinnitus through activation of cochlear NMDA receptors. J Neurosci. 2003;23:3944-52. Watanabe M, Maemura K, Kanbara K, Tamayama T, Hayasaki H. GABA and GABA receptors in the central nervous system and other organs. Int Rev Cytol. 2002;213:1-47. McDonald BJ, Amato A, Connolly CN, benke D, Moss SJ, Smart TG. Adjacent phosphorylation sites on GABAA receptor beta subunits determine regulation by cAMP-dependent protein kinase. Nat Neurosci. 1998;1:23-8. Sun W, Lu J, Stolzberg D, Gray L, Deng A, Lobarinas E, Salvi RJ. Salicylate increases the gain of the central auditory system. Neuroscience. 2009;159(1):325-34. Bauer CA, Brozoski TJ, Holder TM, Caspary DM. Effects of chronic salicylate on GABAergic activity in rat inferior colliculus. Hear Res. 2000;147(1-2):175-82. McCarty MF, Barroso-Aranda J, Contreras F. Oral phycocyanobilin may diminish the pathogenicity of activated brain microglia in neurodegenerative disorders. Medical Hypotheses. 2010;74(3):601–5. Hwang JH, Lee IT, Jeng KC, Wang MF, Hou RC. Spirulina prevents memory dysfunction, reduces oxidative stress damage and augments antioxidant activity in senescence-accelerated mice. J Nutri Sci Vitaminol. 2011;57:186-91. Romay C, Ledon N, Gonzalez R. Phycocyanin extract reduces leukoltriene B4 levels in arachidonic acid-induced mouse ear inflammation test. J Pharm Pharmacol. 1999;51(5):641-2. Rowley NM, Smith MD, Lamb JG, Schousboe A, White HS. Hippocampal betaine/GABA transporter mRNA expression is not regulated by inflammation or dehydration post-status epilepticus. J Neurochem. 2011;117(1):82-90. Wang DS, Zurek AA, Lecker I, Yu J, Abramian AM, Avraescu S, et al. Memory deficits induced by inflammation are regulated by α5-subunit-containing GABAA receptors. Cell Res. 2012;2(3):488-96. Su J, Yin J, Qin W, Sha S, Xu J, Jiang C. Role for pro-inflammatory cytokines in regulating expression of GABA transporter type 1 and 3 in specific brain regions of kainic acid-induced status epilepticus. Neurochem Res. 2015;40(3):621-7. Massone S, Vassallo I, Fiorino G, Castelnuovo M, Barbieri F, Borghi R, et al. 17A, a novel non-coding RNA, regulates GABA B alternative splicing and signaling in response to inflammatory stimuli and in Alzheimer disease. Neurobiol Dis. 2011;41(2):308-17. Paper submitted to the ITJ-EM (Editorial Manager System) on May 29, 2018; and accepted on June 24, 2018. Citation: Chan YC, Wang MF, Hwang JH. Effects of Spirulina on GABA Receptor Gene Expression in Salicylate-Induced Tinnitus. Int Tinnitus J. 2018;22(1):84-88.